This swap book is from me, Rhonda, otherwise known as MyHandboundBooks. 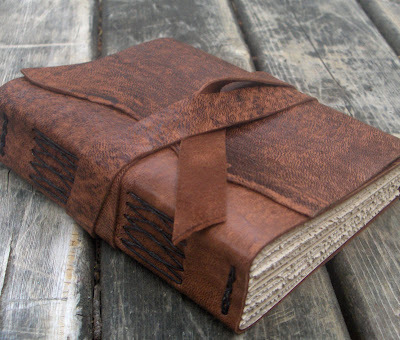 This blank journal has a soft leather wrap-around cover with a natural hide edge on the front. It is sewn with a longstitch and linkstitch binding, visible on the spine in an X pattern. The paper inside is beige speckled text paper with torn edges. You can see more of my books on Etsy at MyHandboundBooks.Etsy.com. 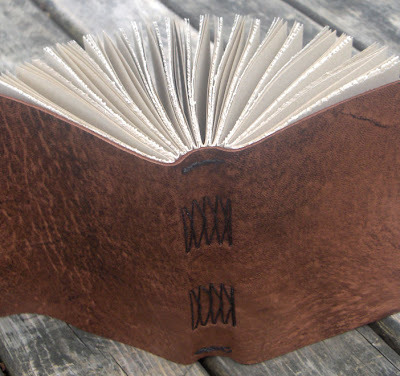 Rhonda's books are always so beautiful, and she always finds interesting leather for the covers! I think her work will inspire me one day to try working with leather.